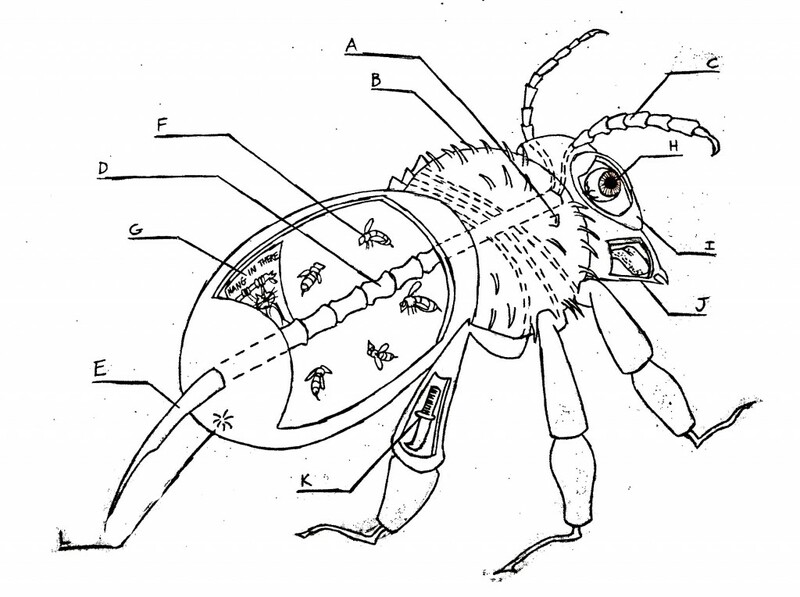 » Anatomy of the Bee (Modern Theoretical) Outdoorsineering! A – Wing attachment point. Bee wings are not innately grown but rather won during bee tests of strength, known as “the time of buzzing”. Because of this hand-me-down nature of bee wings, some wings are believed to be thousands of years old, dating back to primal bees. B – Hair spikes. The bee is believed to grow one strand of this hairlike substance for each sting that it inflicts upon a human (bees do not, as many believe, die after stinging – this is a myth likely propagated by bees themselves). A fuzzy bee is truly a dreadful bee indeed! C – Antennae. Note that what we call the “antennae” of the bee are actually the frontal extensions of the bee’s spinal column, which passes through the core of the bee and exits the other side as the stinger. Bees have vertebrae but no other bones. E – Stinger. Stingers come in three main types – poison stinger (induces poison), paralysis stinger (induces paralysis), and fear stinger (induces fear). They all look exactly the same so pictured here is whatever you wish. F – Homunculi. Inside every bee’s primary body sac are smaller bees, and inside those bees are smaller bees still. An infinite regression. G – Motivational poster for homunculi. H – Eyeball. Aside from the obvious size difference, there are no differences between the bee eyeball and the human eyeball. But the bee eyeball is rarely seen because it is shielded by the eyeball shield. K – Hidden knife. Likely carried without a permit.